I returned home to my apartment after a loooong Day 1 of Orientation Week (the course I started two weeks ago was a pre-session abnormal/insane thing) to find a box on my doorstep. It was heavy, and I opened it to find that my SUPER-awesome, now former roommate SpeedyKate just sent me a care package, totally making my Monday! Included in this box of amazingness was a whole pan of Sluttier Brownies. Which is why the box was so heavy and I miiiight just follow suit (just kidding, I'm sharing with friends)(OH LOOK I've already made new friends!). 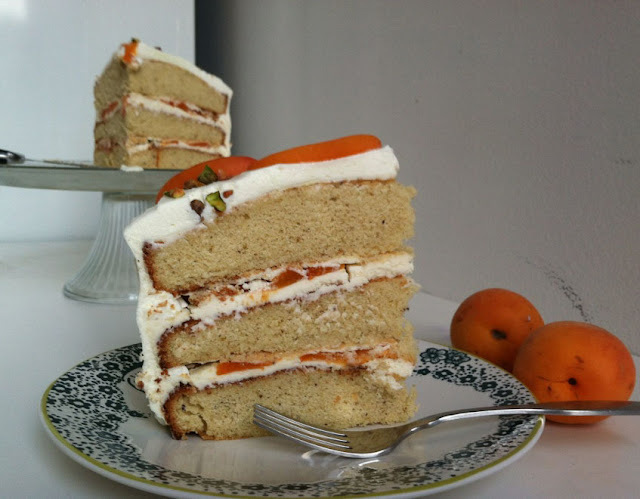 In honor of this, I'm re-posting the recipe. Because if you have not already tried these you must do so. And if you want to really make the day of one of your friends/family members/former roommates you should send that person a box that includes these. They will love you forever. Originally posted May 30, 2012. The Eat Run Read scandalousness continues. Judging by the bloggy success of Sister1’s Slutty Brownies, this next creation might just blow the internet’s mind. It’s her same recipe, but with one incredibly important addition to take these brownies to the next slutty level: peanut butter. Because on a scale from one to insanely intense, these score HIGH on the intensity side. See printable recipe for from-scratch brownie instructions. I used a family-sized box mix this time. About 1/2 cup peanut butter (chunky or smooth, whatever you like). Preheat oven to 350 degrees F. Line a 9x13 baking dish with wax paper and spray it with non-stick cooking spray. For the Chocolate Chip Cookie Layer: Cream the butter and both sugars in a large bowl with an electric mixer on medium speed for 3-5 minutes. Add the eggs and vanilla and mix well to thoroughly combine. For the Brownie Layer: prepare box mix according to instructions. Assembly: Spread the cookie dough in the bottom of your prepared pan. Spread peanut butter on top of the Oreos. Top the cookie dough with a layer of Oreos. Pour the brownie batter over the cookie dough and Oreos. Cover with foil and bake at 350 degrees F for 30 minutes. Remove foil and continue baking for an additional 15-25 minutes. Let cool completely before cutting — brownies may still be gooey in the middle when still warm, but will set up perfectly once cooled. Note: To half this recipe for an 8×8 brownie mix, simply half the chocolate chip cookie dough ingredients. As my last post implied, my first couple weeks of grad school have been a bit rough. But what is the best way to deal with problems, from academically-induced stress to homesickness to group project frustration to it's-too-hot-to-sleep tiredness to eww-I-have-to-make-new-friends anxiety? Running well duh! So on Tuesday night I decided to run a route I knew would remind me that a) I live in Boston, and b) I like Boston. My old routes (from college) are all Allston/BU-based and quite the hike from where I live now, but there is some middle ground along the Charles River. 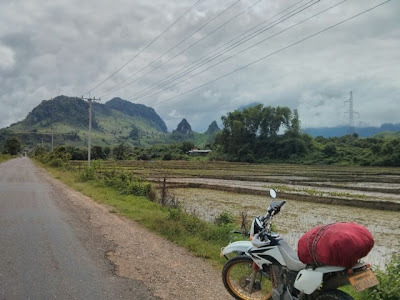 This is not my bike, but it's the best picture I could find of the view I was going for. Running "River" makes me feel like cross country (yes, that is an emotion) and reminds me of some of my best (and worst) college running experiences. Ugh I can distinctly remember barely hanging on as my teammates picked up the pace and picked up the pace and picked up the pace in an impromptu race along the bike path that no one acknowledged but everyone knew was happening but no one was going to be the girl to say let's slow down. Clearly freshman Mollie was dying and falling off the back. Silently. But I also associate River with the most beautiful fall and spring days and feeling fast and awesome as we sped past all the casual joggers. The stretch between Harvard Square and the BU bridge is definitely not the most scenic stretch of the bike path, but it offers views of rowers and water (well duh) and you run through some very green riverside parks along the way, so it's not too bad! Just getting to the river took me 20 minutes (2.6 miles), and considering my current state of fitness, anything longer than 40 minutes is pretty looooong. So I only spent a third of my run on the river. But it was nice, and once I get into higher mileage I will get further. Plus there is a HILL in the first mile (on Lowell Street) that is no joke. I recommend it for all you Boston/Cambridge/Somerville runners out there! Here's a link to the out-and-back route, from Davis Square to Harvard Square to the BU Bridge and back. Oh and I recognize this is a Weekend Report about my run on Tuesday...but just go with it. All I did this weekend was work on a group project and go for meandering runs, so my Tuesday run struck me as the most interesting to share with you all. Hello friends!!! I am in Boston (Somerville to be more exact) -- alive, well, and starting the next two years of my life. My first 24 hours here were a little bit rough. I arrived last Sunday on a red-eye (Who designs airplane seats??? Sadists. ), napped at Jess's apartment (we're now neighbors! ), then hung out with her for the day. Sounds good right? It was. I meandered over to my new apartment in the evening, met my two roommates and my subletter who is still in my room for a week (i.e. I can't actually move in/unpack yet), and thought, hmmm you know what would be nice? Not wearing traveler clothes to my first day of school! So I went down to the basement (where all my stuff has been stored since May), opened a suitcase, and discovered that almost EVERYTHING is moldy. Me: Lahdidah going to pick out clothes.....GAHWHATTHEOMGEWWWW! I will spare you the gory details, but let's just say that (after panicking of course) I have done A LOT of laundry, soaked many a thing in white vinegar (which actually works), hung clothes alllll over the apartment, and have probably inhaled enough mold to kill me if I didn't have the stellar immune system of a seasoned Africa/India/Southeast Asia traveler. And while the mold situation was unfolding, I started class on Monday morning! It felt so weird doing the whole back-to-school thing after 4 years of being a full-time adult. But oh man guys, I'm in a two-week intensive course and it is sink-or-swim, no-adjustment-period allowed! The first day, the professor and some second year students were talking it up -- this is the hardest course you will ever take, and the most work you will ever do in three weeks, and the biggest final project on par with your capstone. Us first-years looked at each other, wide-eyed in terror and confusion. Were you expecting this? What have we gotten ourselves into? BUT dear readers, I promise you that Eat Run Read will not become a litany of annoying grad school rants. (You know what I'm talking about: I'm so busy and important! Have I told you about how much reading I have? My life is so hard and you just can't understand!) because that is boring, and selfish, and not what this blog of joy and exercise and rainbows and sunshine and cookies is all about. 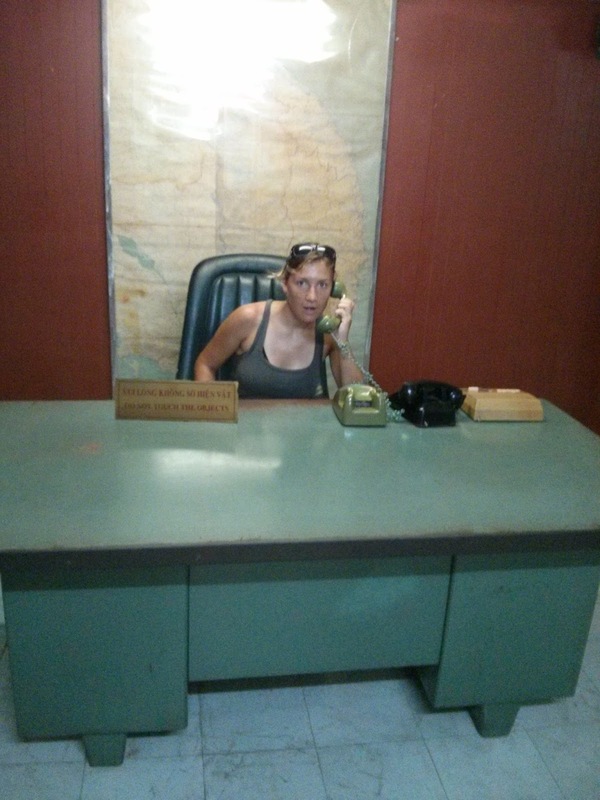 I am just telling you now to explain why I dropped off the face of the earth this week (and probably next week too...and possibly the week after that...but the week after that I hope to be more normal!). I do hope/plan to return to regularly scheduled programming soon (Weekend Reports, Cakes of the Week, Literary Bites, Best of the Week, etc. ), it just might take some time. Oh! And semi-tangential, but I am running again! It is a necessary component of keeping myself sane through this academic boot camp experience I am having, and also a really good way to break up an entire day of un-fun reading. There's a really nice bike path right next to my apartment, and the weather has been gorgeous, so that is a win! In Transition: Petaluma, Lake Tahoe, then on to Boston! My transition back into real-life America has been gentle to say the least. I arrived home in San Francisco on Saturday morning and have spent the week with my family in California (in Petaluma and Lake Tahoe) on what could be termed a post-vacation vacation. Because what do I need to do after having fun for two months? Have more fun!!! We hit the Americana hard on Day 1 with a trip to the Sonoma County Fair. My sisters and I grew up going to the fair every summer, entering our artwork in the children's competitions, riding the rides, watching the horse races, and showing sheep and chickens through 4H. 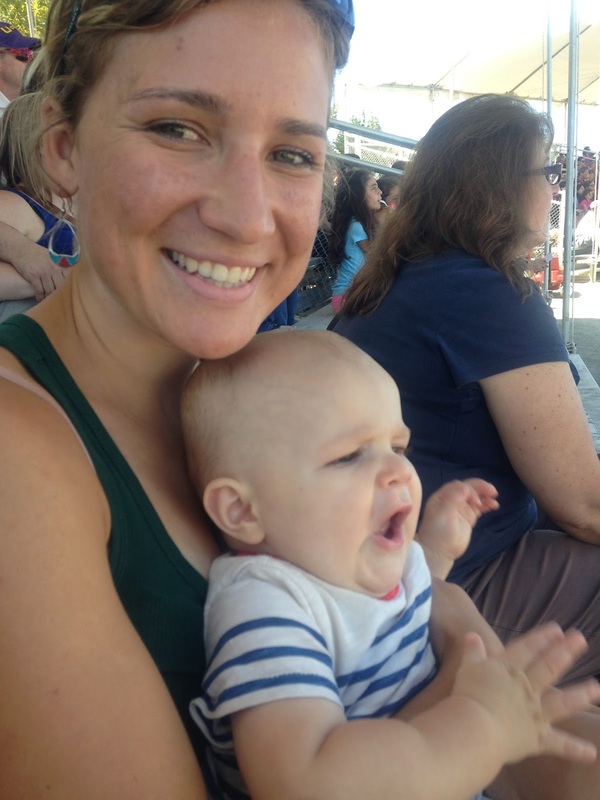 So we were pretty excited to introduce Liam (my nephew -- almost 1!!!) to all the wonders of livestock and free Clover ice cream cones and corn dogs and giant turkey legs! He had a great time. 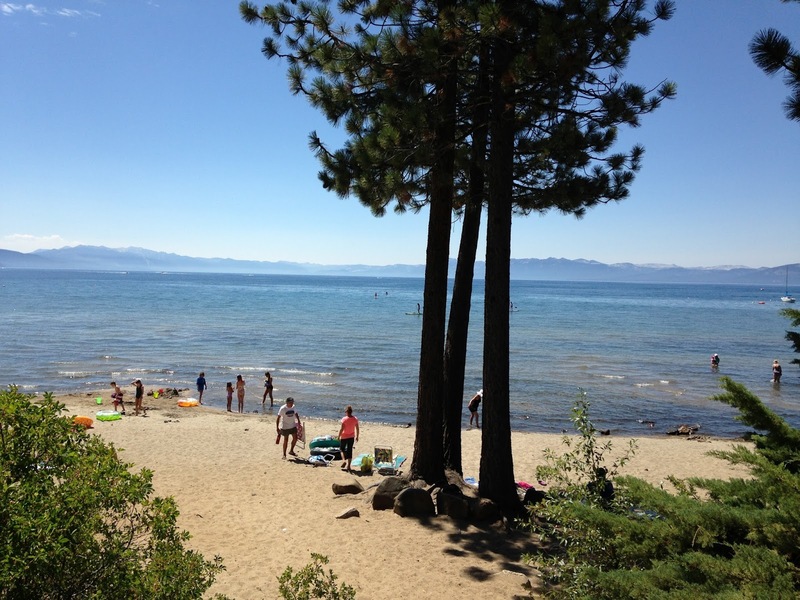 Then my parents and I headed to Tahoe to get our beach/mountain time in! I wake up, work out, then go to the beach. My life is absurdly hard, I know. In extreme contrast to my entire Asian experience, the air here is SO DRY! I'm not sweaty at all and I don't even know what to do with myself. 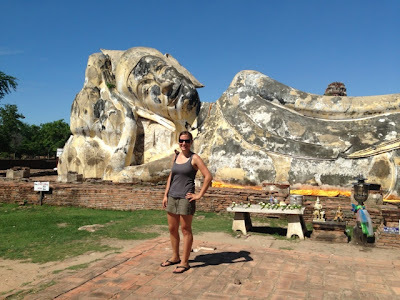 Don't worry though, I'm still wearing my same traveler clothes every day, in true traveler-fashion, because all my stuff is stowed away in a basement in Massachusetts. Liam is such a BIG little person!!! And dun dun dunnnn, I've decided that after a lazy couple months it's time to kick myself back into shape, so I'm running again! Also because I cannot say no to the trails in Tahoe, they're just too perfect to pass up. Lake Tahoe is at about the same altitude as Dalat, Vietnam, but it feels so much higher because of the thin air. So slowly-slowly I am running. My mama is in hiking training for this, so for the past two mornings she and I start at the same time: I run until I feel like stopping, and then I meet up with her for the rest of her hike. Yesterday I covered 14 miles and today was 12 -- not too shabby! And to truly shock my system, I threw some yoga into the mix as well. Squaw Valley offers a free outdoor yoga class at 6 pm every Wednesday, so we went to check it out. Guess what's hard after two months off and many many loooog bus rides? EVERYTHING about yoga. On Saturday night I board a plane yet again. 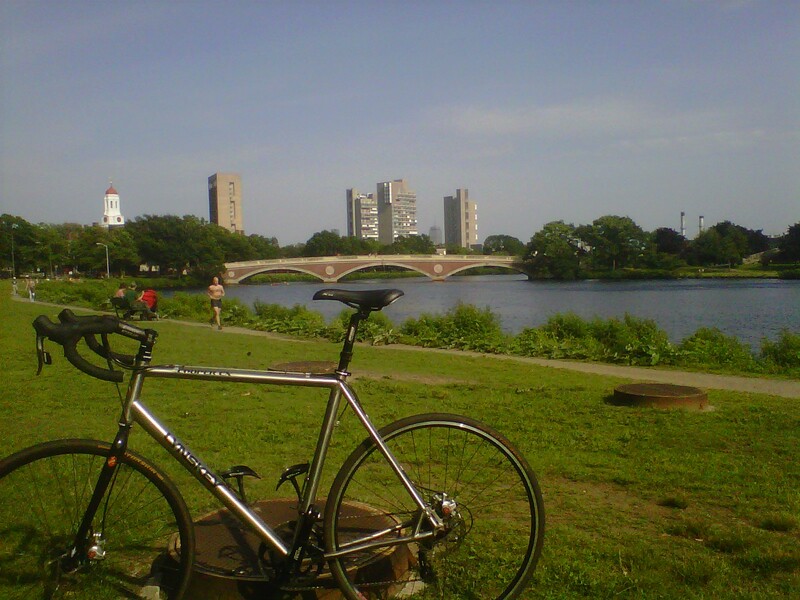 This time I go to Boston, completing my circumnavigation (woot! ), and start classes on Monday! Eeeeeekkkkk! and 1 day in South Korea. It's been like doing seven vacations in one trip. I've done a lot of things and learned a lot of things -- this wasn't a "finding myself" venture by any means (I already know me pretty well), but I was frequently forced to be brave and more uncomfortable than I would normally choose. 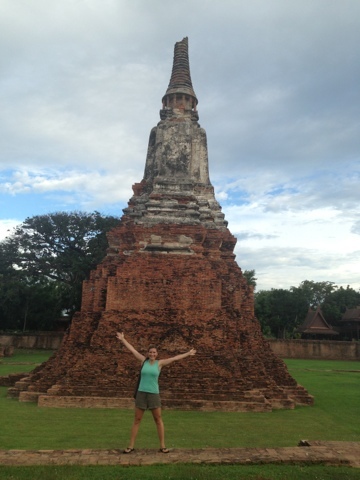 I feel like I've been traveling forever, but at the same time I can't believe it's already over! I'm sad to leave of course -- this traveler lifestyle is something I could get used to -- but at the same time I'm ready for certain home things, including but not limited to my family, constantly available drinkable water, preparing my own food, washers/dryers, truly clean feet, and having access to more than four outfits. As you know, I spent all of Nepal within 5 feet of Sister2, and then most of Southeast Asia within 5 feet of Andy. Two major travel partner wins, since they both like to do the things I like to do, try all the food, and walk a ton. 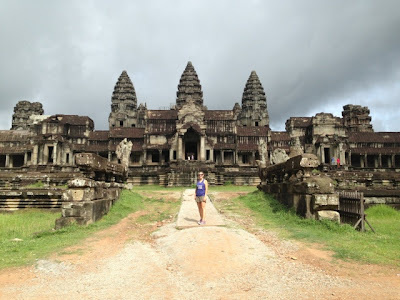 If you've been following my posts all along then you know what I've been up to, but here are my retrospective highlights and things I would have done differently from the Southeast Asia portion of the trip. Dirt biking to the waterfall in Luang Prabang, Laos. The second day camping at Erawan Falls, Thailand. 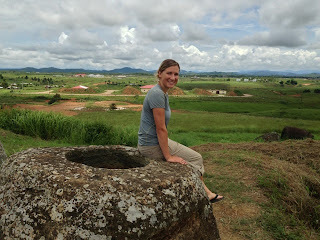 The Plain of Jars in Phonsavanh, Laos. Excluding long days-o-bus rides, the last day in Bangkok. It ended in massages and delicious food, so it was not a total loss by any means, but the day itself was hot and super-polluted and draining. Cities after too long (2 days) wear on me. 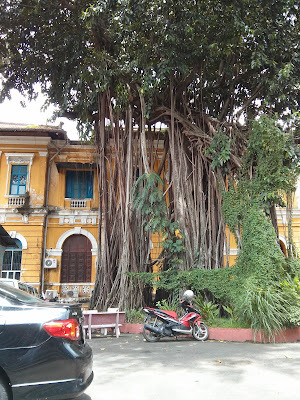 Hue (it was fine but not amazing). 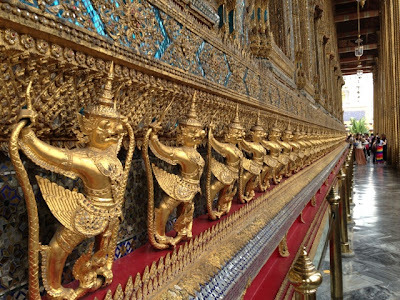 Thais -- I love how much they smile! It's waaaay too hard to pick just one thing -- so I'll say Vietnam. All of the things. 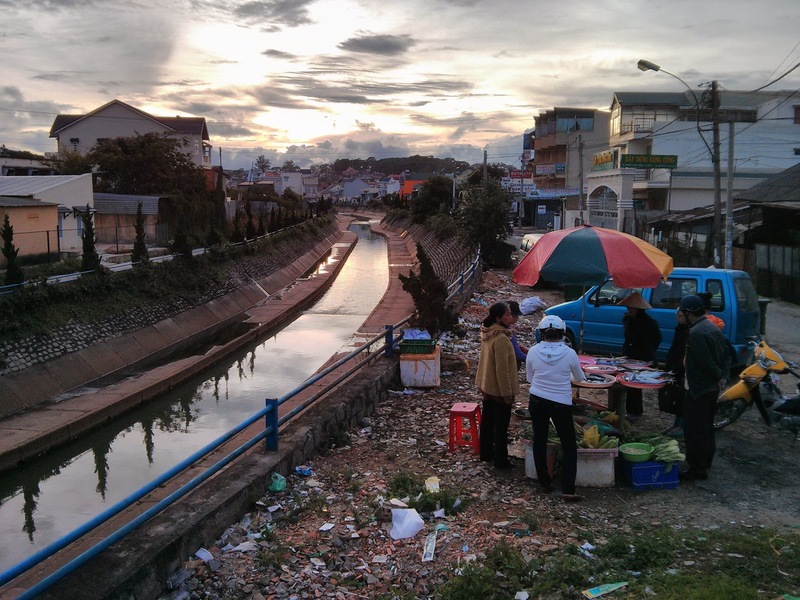 Cambodia was the least exciting food-wise (pho pho pho pho). But oh man this coconut curry ("Amok") at Angkor Wat was delicious! 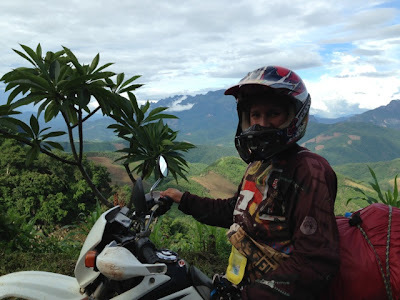 There was a Class 3 whitewater kayaking experience outside of Luang Prabang. I didn't blog about it at the time because it was mostly upsetting and terrible and scary. It was also really unsafe (despite the very legit-looking guide company there were NO safety precautions taken), so I do not recommend doing this. 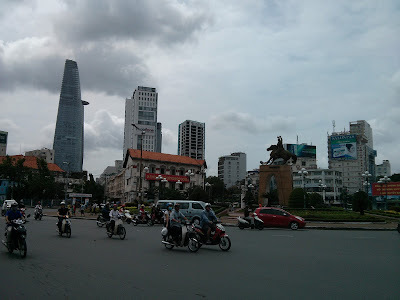 I had every expectation of hating Saigon/Ho Chi Minh City. Everyone we talked to was pretty meh about it, "just a big crowded city," "not very nice," "one day there is enough," they said. 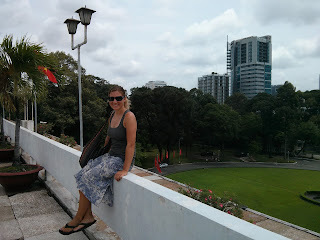 But of all the big cities I've seen on this trip (Kathmandu, Bangkok, Vientiane, Hanoi), Saigon is my favorite by far! 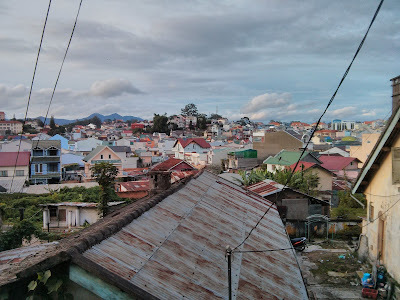 The food is amazing, the touristy district is fun but not Disneyland-ish, there are tons of big trees and green space, the streets are wide and have sidewalks, and I could actually imagine living here. On the roof of the Presidential Palace. We spent two days in Saigon (it's officially HCMC, but everyone still calls it Saigon), doing our usual new-city thing of walking 500 million miles looking at everything (remember this tumblr? Could be my life.). Traffic circle in Saigon -- I am so good at walking into the middle of speeding traffic! 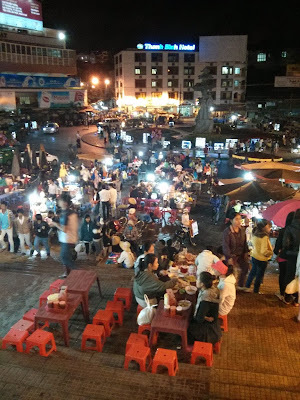 We sat at a late-night street bar/restaurant (i.e. tiny plastic stool on the side of the road), people-watching hundreds of locals and other travelers hanging out late-nigh style (beer and dried squid anyone? ), and also saw a guy breathing fire! So random but so cool! Just a cool tree in Saigon. 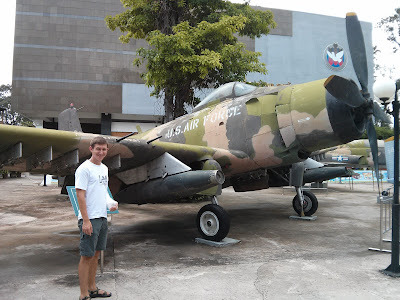 On our first day I insisted we spend some serious time at the War Remnants Museum, which, though depressing, is definitely a must-see. 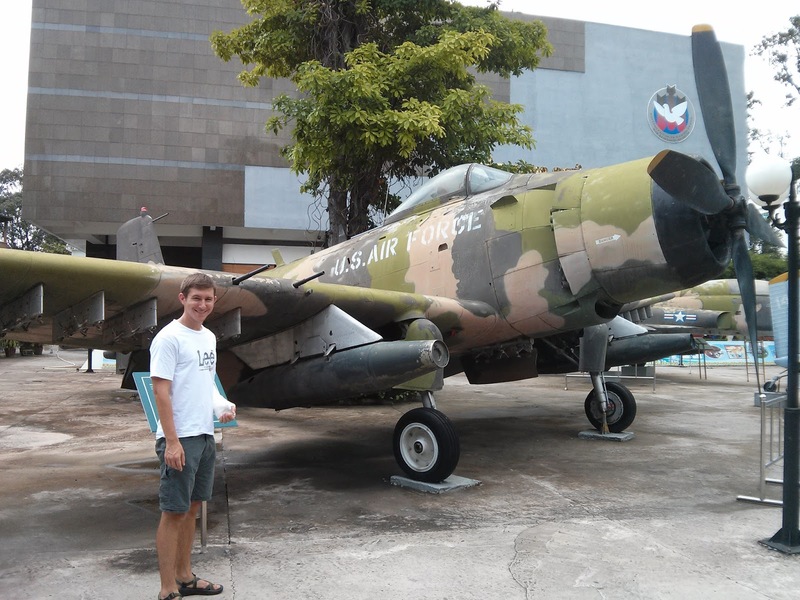 We checked out some pretty cool aircraft and tanks from the Vietnam War, saw lots and lots of pictures, learned about prisons and torture and agent orange (ugh bad stuff), and saw before-and-after photos of Vietnam's post-war reconstruction. 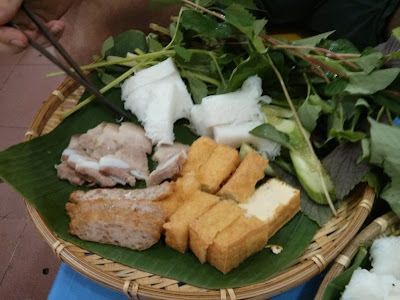 After the museum we cheered ourselves up with a traditional Vietnamese lunch of fried tofu, pork, cucumber, rice noodle cakes, and herbs. You eat this all together, kind of like sushi, dipped in soy sauce and/or hot sauce. And then we had coffee -- so much coffee! 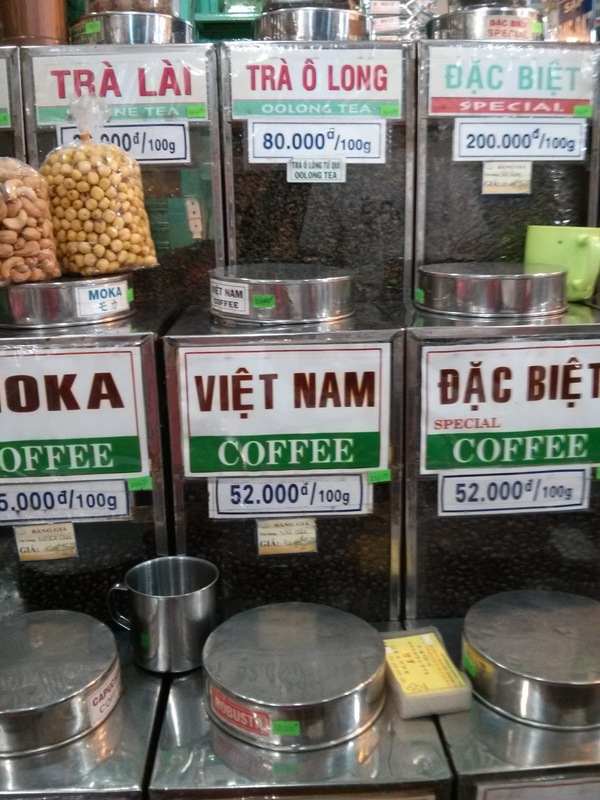 Vietnam is known for its coffee, and Saigon is known as Vietnam's biggest coffee city. Like Dalat, there are coffee shops all over the place and the coffee is all delicious: super-dark and rich and chocolately and not acidic at all. I could drink it all the time...and that is exactly what we did in Saigon. It's served in tiny cups, always accompanied by a glass of iced green or jasmine tea. Since the coffee is so dark, you're supposed to water it down with the tea until it's drinkable. 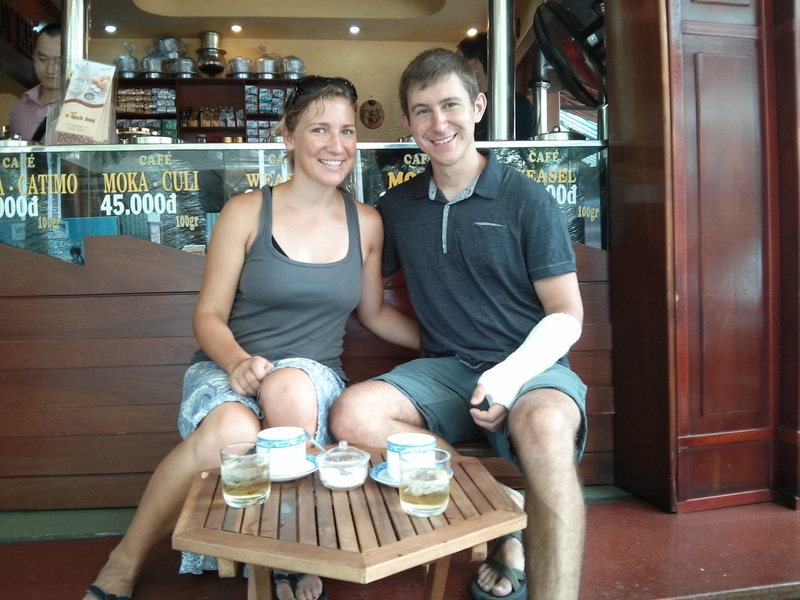 Our second day in Saigon (my last day in Southeast Asia!!! 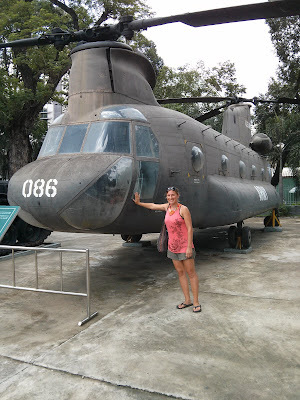 ), we toured the Presidential Palace, which is pretty much frozen in time from when the North Vietnamese tanks rolled in in April 1975, ending the war. The basement is a series of war rooms with radios and various coding and communications devices and maps on the walls. Pretty cool! My final Vietnam to-dos included a back alleyway haircut (shockingly not bad! ), one last massage, buying coffee beans, and a final fantastic dinner. 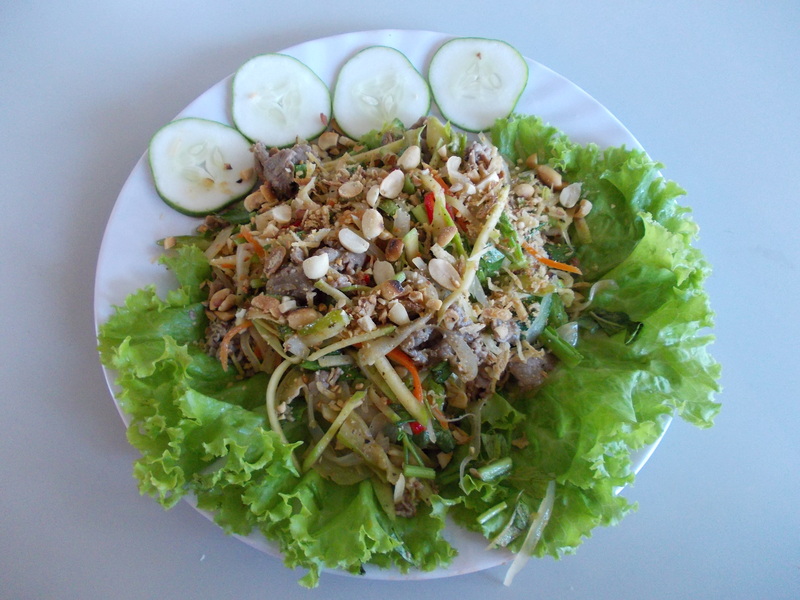 The restaurant served Hue-style food, which is a lot of small plates and seafood dishes. We had a tiny clam salad (the clams were tiny, not the size of the salad) served with warm rice crackers, tiny clam spring rolls, and a cold noodle salad with beef and pork and many many herbs. It was all so good and only $8. I am going to miss this so much! Dalat is known as the "Seattle of Vietnam" -- a cool, dry, heavily French-influenced mountain town where Saigon's residents escape the heat of the coast. You know I love the mountains, and I also love not being sweaty, so Dalat is the place for me! We bussed our way up here, slowly slowly (seriously, like 10 mph up the hills), through acres and acres of coffee plantations and rows and rows of flower-filled green houses. The city really does feel different from the rest of Vietnam -- I'd say a mix of San Francisco, the French Alps, and Anywhere City Asia of course. The Seattle part comes from the coffee -- that and strawberries are their thing, and there is literally a coffee shop every third storefront. So Yes please I will have a fresh chunky strawberry jam baguette with my coffee, mmmk thanks! The canal that goes through town. 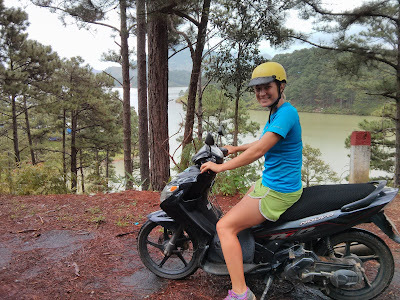 Psyched to get our outdoorsiness in, we rented a motorbike to go check out Lang Biang Mountain, about 10k outside the city. When we arrived we saw "zebra" rides (so weird and random), and a paved road to the top of the mountain. Hmmm, well that's a little bit disappointing...let's see if we can make this more interesting! Andy pulled out his Open Street Map GPS App (seriously a lifesaver -- we probably would never have made it out of the streets of Bangkok without this gadget), and found what appeared to be a trail up the mountain someone had marked. I am becoming a pretty pro scooter-driver. Well that Someone must have been a deer, or maybe a bird, or possibly a professional bushwhacker, because there was nothing even remotely trail-ish about the route we traced up and down the mountain. On the way down, we gave up on the "trail" pretty quickly and instead off-road navigated our own way down the steep mountain, through brush and prickers and rocks and trees. This resulted in a cultural/agricultural detour through a series of coffee, carrot, and strawberry fields. I can't imagine what the farmers thought of us -- two giant bewildered foreigners (one casted), plodding through their rows of crops and every so often pausing to look intently at a phone to re-oreient. It was touch-and-go for a while there, but I'm happy to report that we survived! 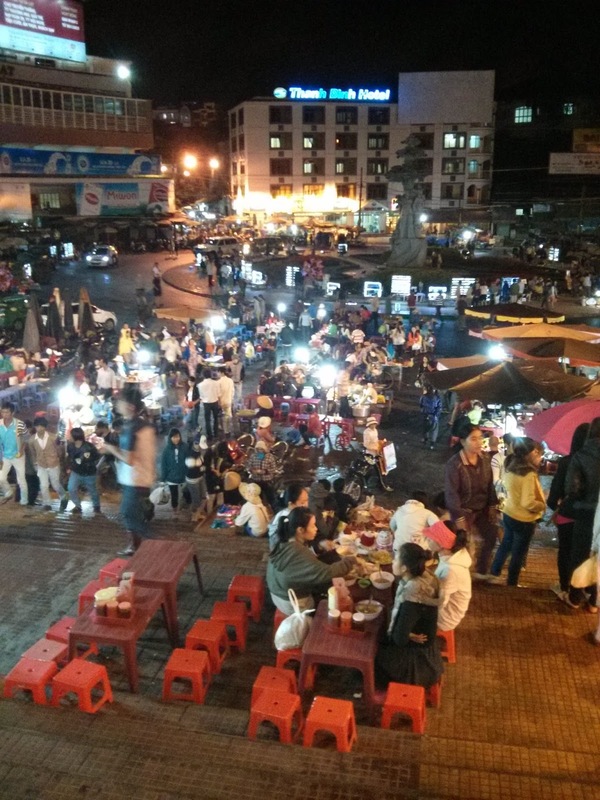 For such a sleepy slow-feeling town, Dalat had a hoppin' night market! It contained streets and streets of clothes and shoes and trinkets, plus many many snacks (meat on a stick! dried squid! 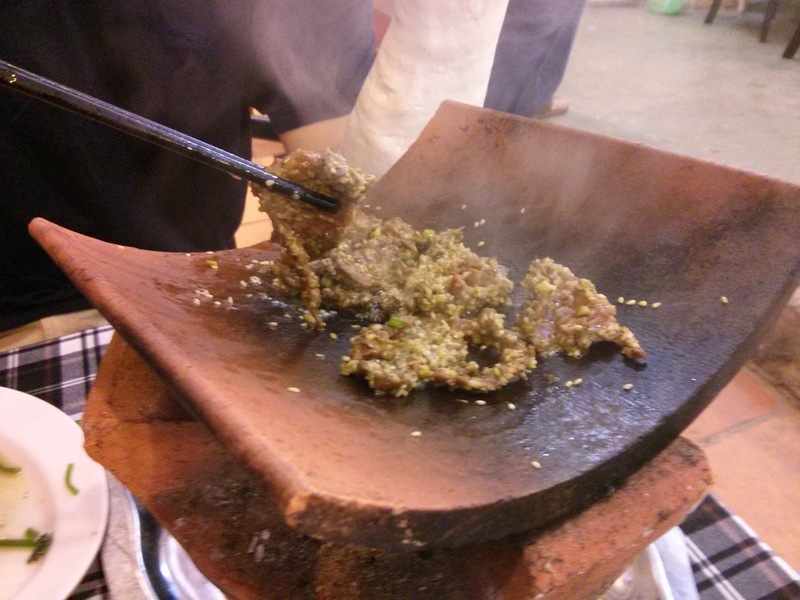 omelet on a portable barbecue! roasted sweet potatoes and corn! hot milk! ), and delicious fresh fruit from the local farms (plums and pears and strawberries!). I bought some strawberry jam and also a bag of artichoke tea, their other specialty. 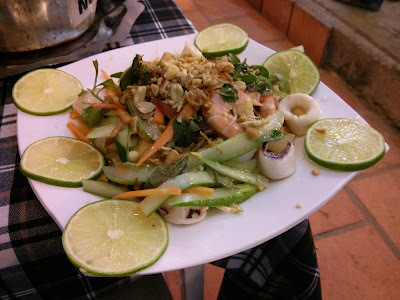 We had a REALLY good dinner here too -- steak strips with sesame (you cook your own on a terra-cotta shingle), and Seafood Vietnamese Salad, which is squid and shrimp and shredded cucumber, carrots, hot peppers, peanuts, cilantro, mint, and lime juice. 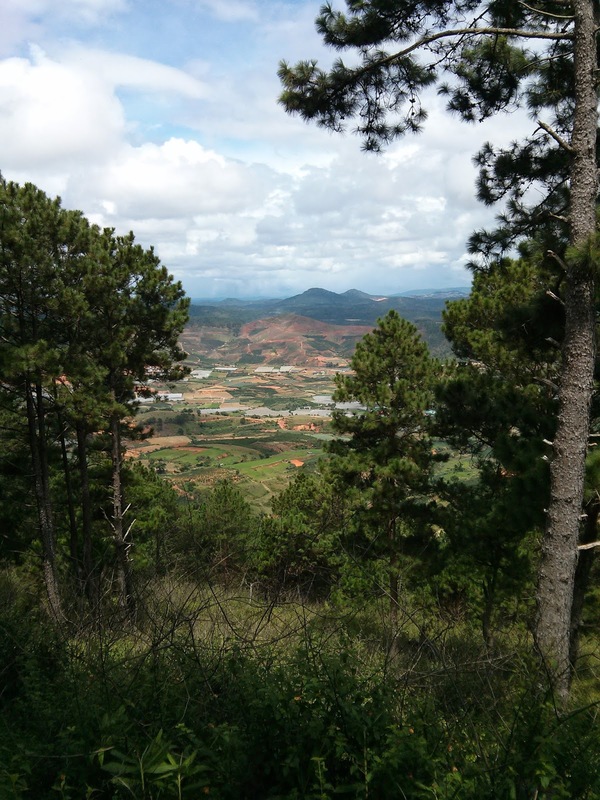 I highly recommend Dalat as a great change-up from the humid Vietnam coast. If you go, stay at Hotel Pink House, which has really big rooms with great windows and water pressure. And get breakfast at the place next-door that advertises "American Breakfast." It has relatively big cups of coffee, and the best fried eggs I've ever had -- two eggs over easy over rice with chives and the spicy/sweet/vinegar sauce that is everywhere here. Plus, SO MUCH DELICIOUS COFFEE EVERYWHERE!